Fury Unleashed is a roguelite platformer shooter game, where you play through pages of a procedurally generated comic book. Its gameplay requires quick reflexes as well as tactical planning of next moves, and stands out due to unique combo system that rewards you for quick and efficient kills. Very Positive (232) - 87% of the 232 user reviews for this game are positive. “TL;DR: Fury Unleashed is coming together really nicely, but we want to make our game even better! You can help us do that with you priceless feedback! At the current stage of development it would take about 12 hours to complete the game. The price will likely increase as we develop and add more content to it. “Current version has three comic books fully done. With the final Early Access update, we'll add the storyline and the epilogue, which will be a bit smaller than a single comic book in terms of content. There will be many more features available for the player’s character too, including local co-op, weapons and more customization options. The sound effects will also get a complete overhaul. Update #49 - Fury Unleashed unleashes its true visual potential! Now we’re sure this one isn’t something you guys have been expecting as we’ve been silent about it. But this doesn’t mean we haven’t read your comments and Steam reviews. We’ve also been taking a close look at previews and let’s plays. We’d love to hear from you – tell us if you like these changes and if you think it’s a good direction. And if you do, please consider leaving a review - they're more imporant to us than you'd think! So, without further ado, jump straight to the game, test all the changes, and let us know what you think of them! Also, don’t forget to follow our Steam Profile us on our social media (Discord, Facebook, Twitter) to be always up to date with all the changes we’re bringing to the game. Update #46 - Fury Unleashed’s storyline unveiled! We have quite a piece for you today. But before we begin, please meet your new companion – Mr. Doodle. Starting today, he will assist you as a guide through the world of Fury Unleashed. 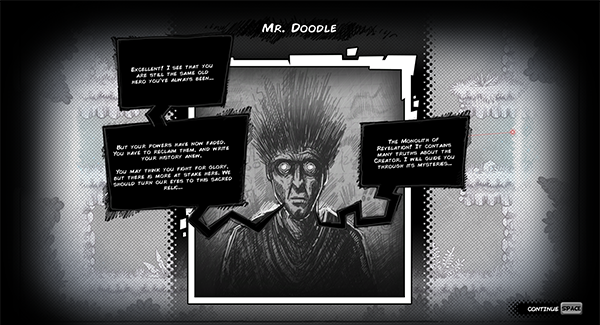 Mr. Doodle will tell you the entire enigmatic story that fills the pages of our comic book. He will be providing narration, leading you through all the blood-curdling battles and struggles. Don’t get us wrong, he won’t help you dispatch any monsters on the way – absolutely not. He just does the talking. Our pal will introduce you to the stories in the three available comics, and when it’s time to leave Early Access, each story will come to an end with the addition of Epilogue World, which takes place in the sketchbook. Believe us when we tell you: it’s worth the wait! As usual, we have even more for you today. We really enjoy treating you to new functionalities and seeing you all having fun learning new possibilities and discovering how to beat completely fresh obstacles and opponents. So how about adding a bunch once again? And as usual, bug fixes and performance optimizations. That’s it for today, Heroes. Thanks for stopping by. If you like what you see, consider following us on our social media (Discord channel, Facebook, and Twitter!) to make sure you’re always up to date with all that we have in store. Fury Unleashed (*previously called The Badass Hero) is a rogue-lite action-platformer, where you play through pages of a comic book. Experience fast-paced hit-and-run gameplay. And never do the same thing twice, thanks to procedurally generated levels and random items. All in highly refined, modern, hi-res 2D art. Action platforming with 360° shooting – jump, dash, shoot, slash and blow things up! - Defend the Earth from alien invasion in "The Last Stand of Earth".